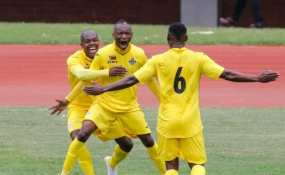 Khama Billiat celebrates with team mates after scoring (file photo). The Zimbabwe senior national football team has booked a place in the 2019 Africa Cup of Nations (AFCON) finals in Egypt with a 2-0 defeat of Congo-Brazzaville in a Group G final encounter played at a packed National Sports Stadium Sunday afternoon. A beautifully taken free kick by Kaizer Chiefs star Khama Billiat after 21 minutes and a volley by skipper Knowledge Musona off a Congo defensive mix-up 15 minutes later ensured Sunday Chidzambwa’s men finished top of the group with 11 points to their tally. The Warriors needed just a draw to book their second successive appearance at the AFCON Finals while Congo needed an outright win to qualify for the continent’s most competitive football tournament. Before the match, there was a minute of silence in memory of over 150 people who lost lives during Cyclone Idai in Manicaland and Masvingo over a week ago. The Warriors are joined by DRC who finished on 10 points with Liberia and Congo-Brazzaville failing to make it for Africa’s elite on 7 and 5 points, respectively. It is the fourth time the national side has qualified for the continental showpiece since 2004 and the second time under Chidzambwa who was the first coach to secure qualification.